I am so excited to reveal that I am now on the Doodle Pantry Design Team! Laurie Wilson draws the best images and she is selling them in her own little store: Doodle Pantry. I am in LOVE with the image I got to use for this month’s release, Baby Goat. I decided an image this babyish had to be put on a card in the softest blues and greens I could find, especially since that is Laurie’s blog challenge this month, use blue and green in your project. Each month Laurie has a challenge on her blog, if you play, you get a free digi image! I played before and got the nicest images, good quality and so easy to use! You can even use Word or Publisher to print them out, no need for fancy or difficult to use software. So make sure you visit Clearly Delightful today and book mark the challenge, you have one week to play. Make sure you check out the other images she is releasing today! It really is worth it to play. Please visit Clearly Delightful to see all the details for the challenge. Next postI have been the WORST blogger! Congrat's on your DT assignment with Laurie…she is the best!Love your sweet little card. 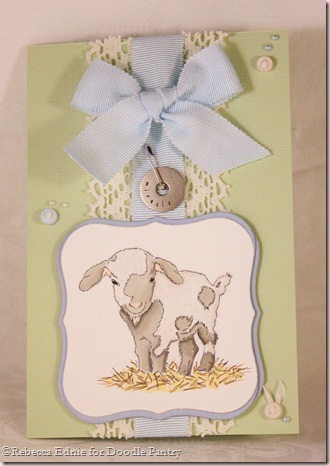 Very sweet card with Laurie's goat Rebecca. I wanted to tell you I love your CIC13 card. Love the horse and your gorgeous gorgeous flower. Nicely done. Gorgeous card! Great job and congrats. Just as precious as can be!!! LOVE how soft and sweet you have him looking! What a beautiful design with the bow and accents. This is just gorgeous…. the soft colors really are lovely on this! Hi rebecca! this is so beautiful! such soft colors and you did a wonderful job with the image! so sweet and soft and lovely! congrats on making the team! Hi Rebecca! What an incredibly sweet card you've created! 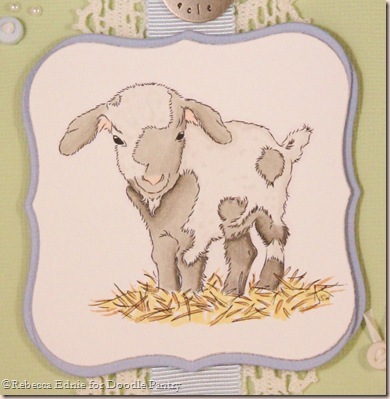 I love how you colored this adorable goat that Laurie illustrated, and all your lovely, sweet detailed embellishments…cute layout, too! Love it! The soft sweet colors, the lace and your layout are awesome! Good Morning! What a gorgeous card and such a fabulous design. Love everything about this beauty! good morning Rebecca!You have made such a darling card using this precious image!!! I love the softness of it! You're right, Laurie drawing are fantastic and we're so blessed to be able to play with them!take careblessings!